Do you have non-mission critical applications that require economical high capacity and reliability hard disk drives? HP SATA Hard Drives are built for reliability and larger capacity needs for today's non-mission critical server applications and storage environments. These high-capacity drives provide the lowest $/GB, and the best price advantage for non-mission critical applications with low workloads of 40% or less. HP SATA Hard Drives are available in both Large Form Factor (LFF) (3.5-inch) and Small Form Factor (SFF) (2.5-inch) and ship with a standard one year warranty. All HP hard drives pass a rigorous qualification process, which certify that every HP drive is proven to perform in your HP ProLiant Server environments. Before final certification, all HP SATA Hard Drives are optimized for compatibility and functionality, including support of SMART and HP Systems Insight Manager. 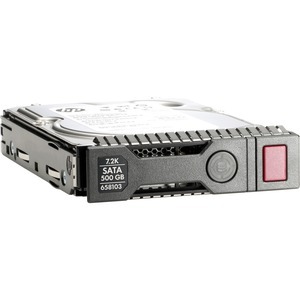 Up to 2 TB SATA SFF 512e Midline Hard Disk Drives. Up to 8 TB SATA LFF 512e Midline Hard Disk Drives. Helium filled drives reducing power usage. Performance drives with improved seek time. The HP SATA Hard Drives increase reliability and lower start-up costs without sacrificing reliability with non-mission critical hard drives at the lowest $/GB. Both cost and capacity optimized solutions provide up to 6 TB of storage in a single device. Available in 2.5-inch Small Form Factor (SFF) and 3.5-inch Large Form Factor (LFF) that are available in a wide variety of capacity points. 6 Gb/sec data transfer rate supporting existing servers.